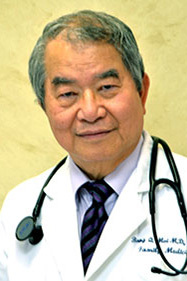 Dr. Dac Vu has special interests in wellness and preventative care, utilizing a multifactorial approach to the early detection of medical conditions, as well as for the management of existing chronic illnesses. His areas of special interest include obesity, diabetes, cholesterol, hypertension, metabolic syndrome and the coordination of care of various clinical disciplines towards the prevention of complications of these conditions. Dr. Vu is a former clinical instructor for physicians in training in primary care at Pacific Hospital of Long Beach, California and was voted the “Clinical Educator of the Year” in 1997- 98. He graduated from U.T. Southwestern Medical School and completed his residency at the University of California in Irvine. His experience encompass the spectrum from primary care in the outpatient setting, to providing care as a hospitalist, as well as previous management as an administrator for an acute care hospital and adult day care in Houston, Texas. He is a certified Diplomate of the American Board of Internal Medicine and re-certified his Board in Internal Medicine in 2009. He hopes to utilize the combination of his experience in management, clinical experience as a physician and his desire to educate others to enhance the quality of life of his patients. He is a member of the Texas Medical Association and Harris County Medical Society. He also serves as CEO of Van Lang IPA, an independent physician association in Houston, TX. Dr Vu is fluent in English and Vietnamese and CI Medical Center's staff are fluent in English, Vietnamese, Spanish and Tagalog. Dr. Vu is GREAT. Very concerned with his patients well being and teaching them about being healthy and staying healthy. Dr Vu is the best Doctor I have ever had! He returns my calls quickly.... even after hours! I travel for a living and he has taken steps to make sure I have necessary info to give medical personnel in another city or country, This is very important since i have been hospitalized out of my home city twice. He truly cares for his patients. Dr. Vu and his staff are the absolute best! I love and appreciate the care that I receive. He is a good Doctor, listen to you, very pacience. Dr. Vu help me with my allergies and explains thoroughly of my condition. Not only he's my doctor but i feel as if he was a friend. Treated me well and pay attentions. I am a stubborn person and it is great to see a doctor who can explain and go through with my questions and concern without hesitation. Dr. Vu is very professional, compassionate and knowledgeable. I highly recommend Dr. Vu.